I was asked to speak at the ladies luncheon this Saturday about The Bridge and our trip to Haiti. 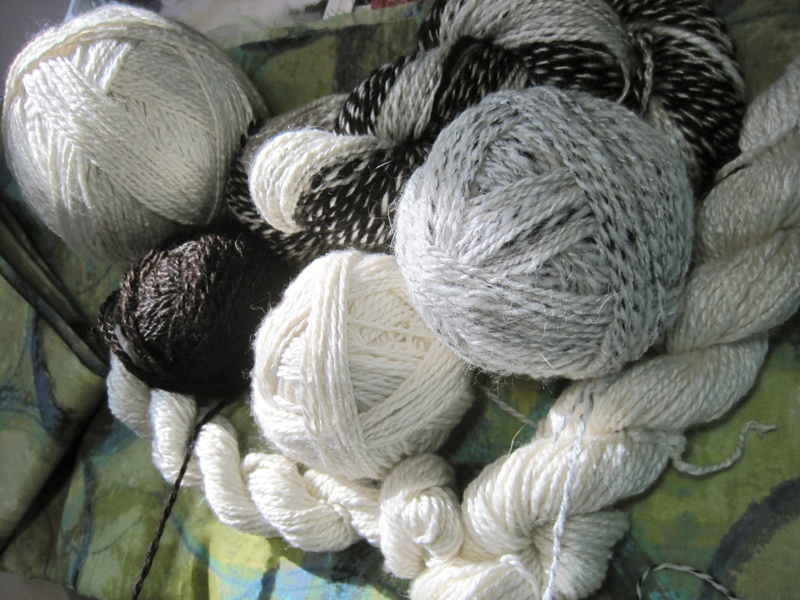 It has seemed to me that my life has run along two parallel but divergent lines for the past year–my housetop quilt project and my work on The Bridge. And they practically intersected during the first week of January. 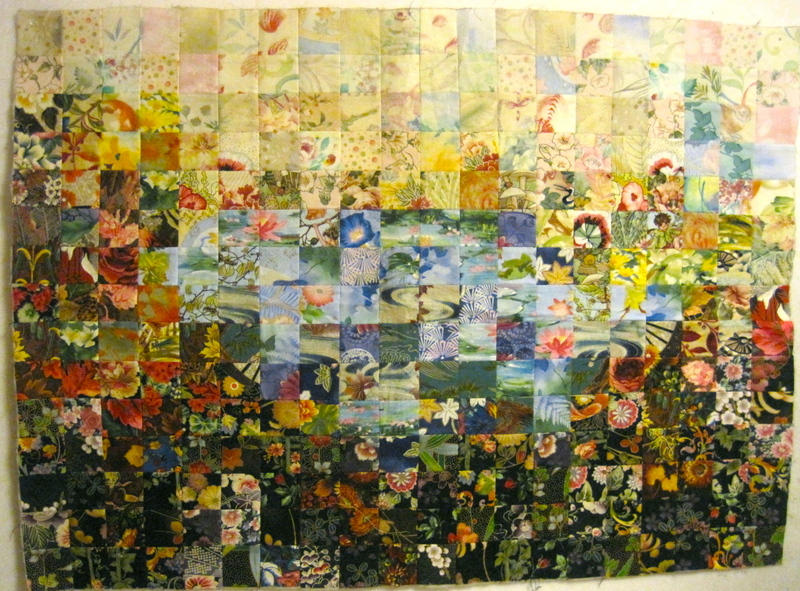 I hung the quilts for the gallery display on Thursday, and Sunday I left for Haiti! So I asked the organizer of the luncheon if I could share how meaningful both projects had been in my life for the past year. And she was most enthusiastic about it! 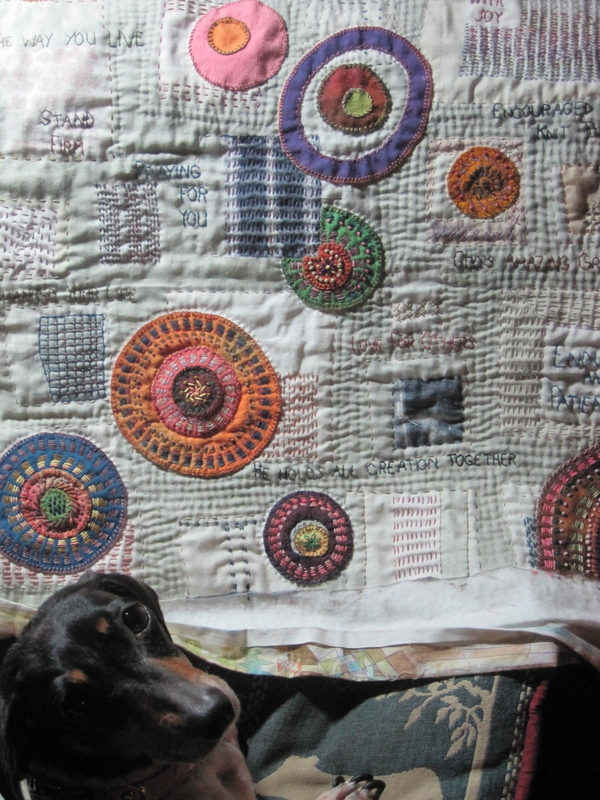 That meant that I had to try to finish two quilts this week. Because both of them were very related to the Haiti trip. 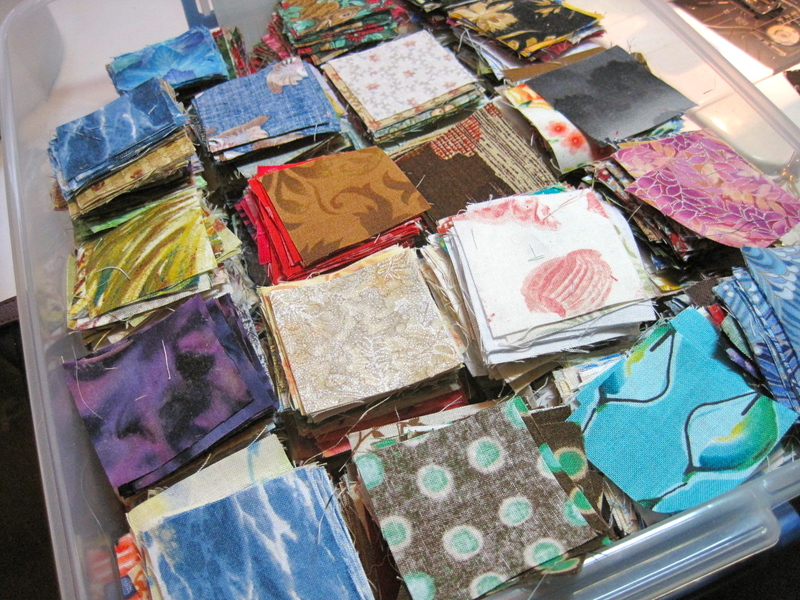 One, of course, is the little travel quilt. As soon as I get off the computer, I need to start stitching like crazy on that one. 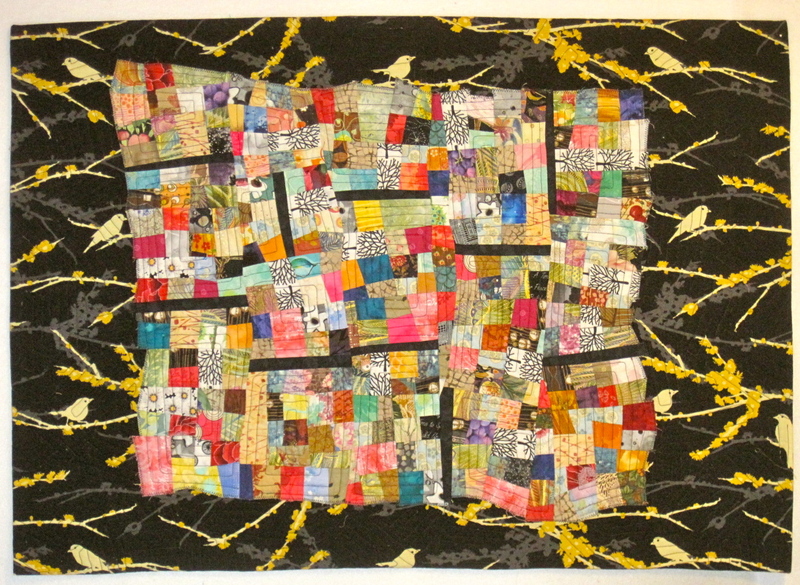 And the second was this quilt. I’ve been calling it ‘the little crosses’ quilt. But the real name is “We Are One.” I shared the meaning behind it here. I finished up the quilting on Monday, and I got all the words stitched onto it yesterday. And today I decided what to use for the binding, and got that put on this afternoon! Whee! It sure is fun to finish a quilt. Sometimes its a little painful, when you are kinda ‘done’ with it and ready to move on to the next project but there are still a lot of finishing touches to be completely finished. 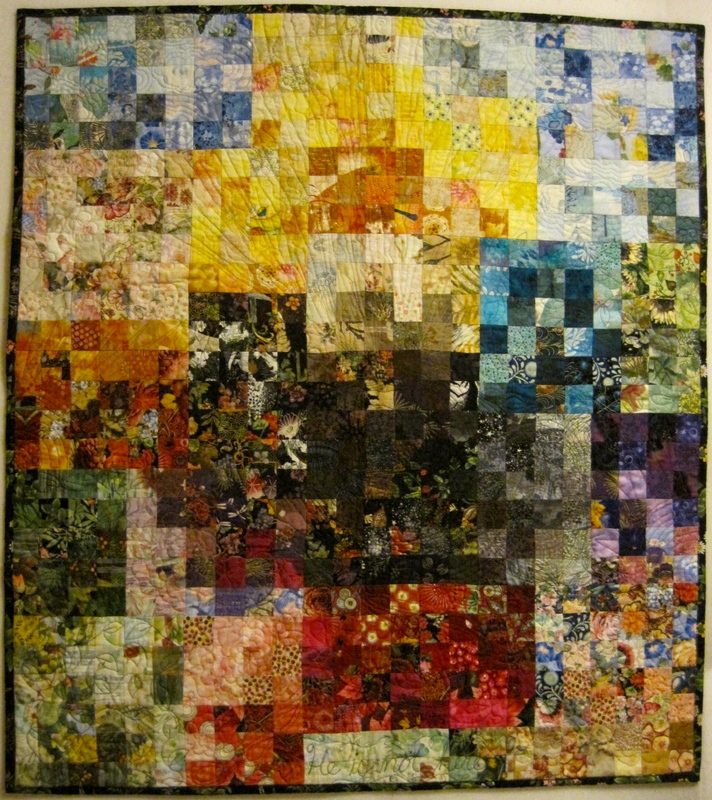 But it always feels great to put that last stitch in the quilt and hang it up to see your finished work. Anyway, here is a shot of the four original blocks–remember, they are the ones I didn’t like, so I cut them into smaller pieces and inserted the crosses. And now I’m off to stitch a bit more! 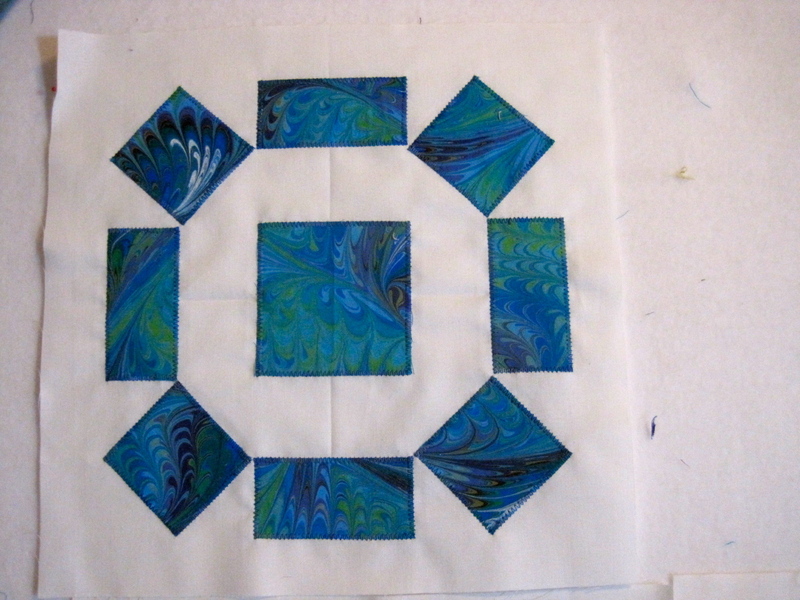 Well, I did go back to my quilting this week, but I got a rather slow start. I had little bits and pieces of ideas, and I just tried them all out. I had six blocks that were made from a piece that I didn’t like at all, so I cut it all up into smaller pieces and sewed it back together. I liked those blocks, but what to do with just six blocks? So they have been hanging around (literally-hanging on my design wall,) for over a year. Sunday night I was thinking about what to do with them, and I thought--hmmm, six blocks. I wonder if I can make a cross with them? And sure enough, I could! I love the way it looks, but once again, it is stuck on the design wall, because I am still thinking about how to ‘frame’ it. Then, I had some more blocks that I had put together in simple uneven strips of 5 color ways–yellow-gold, violet, blue, red, and green. BO-RRRING. So I cut those blocks into smaller strips. I found this piece of gray batik with pink metallic blotches on it, and thought it looked just great with the colored strips inserted. Again, I am not working evenly. I am trying to make them all into 12 inch blocks so that eventually it will be easier to put together. Then, I had this bag of one inch strips hanging around. 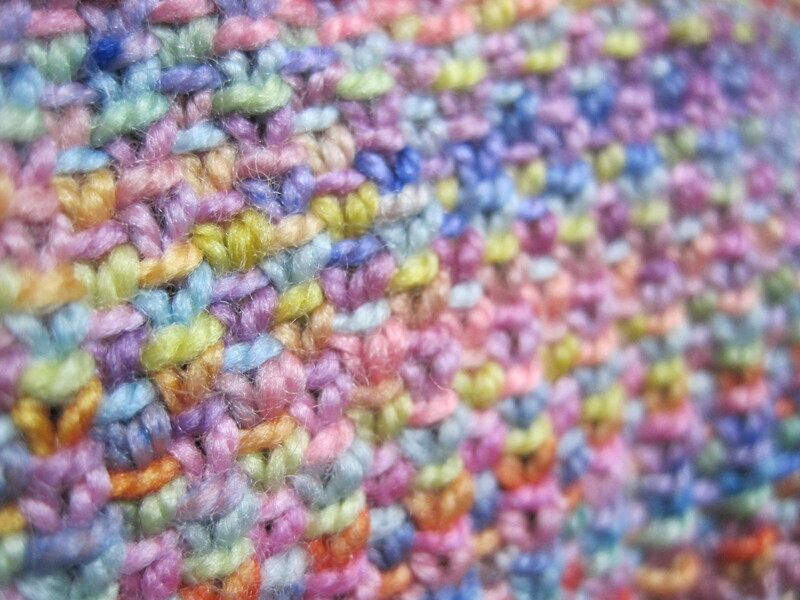 They were leftover from a bathmat that I knitted (yes, I knitted with one inch strips of cotton fabric. No, I don’t recommend doing that. It was pretty hard, and my wrists really hurt by the time I was done. But yes, I do love that bath mat!) ANYWAY, I kept thinking, what could I do with one inch strips? And this morning I was looking through an old journal, and there was an entry where I wrote down “try doing a raw-edge log cabin.” Wow, I answered my own question! Here’s the prototype. I really like how it looks. 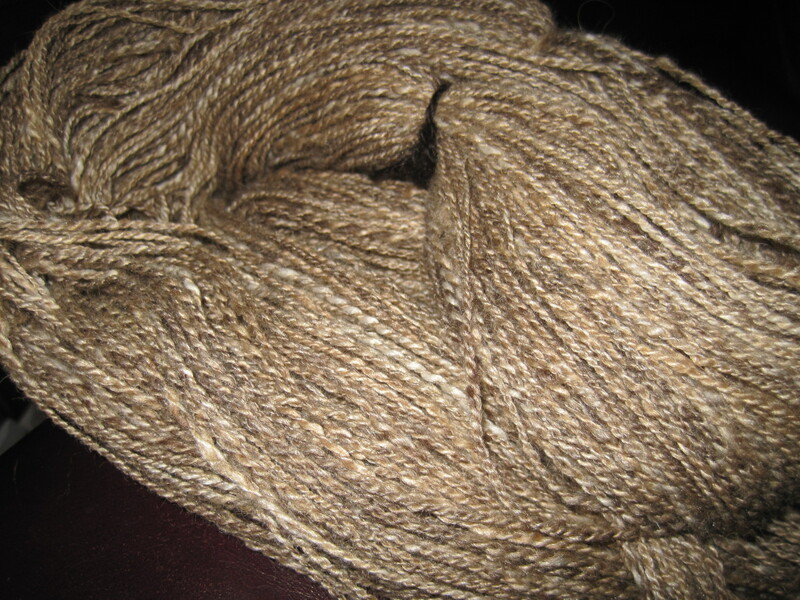 And I think it will be very interesting after its washed. 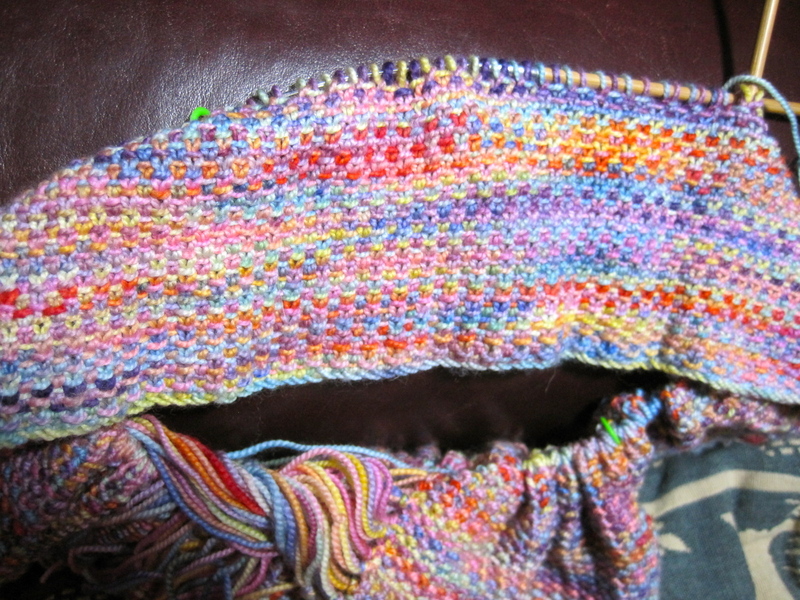 The raw edges will fray and add a lot of texture. 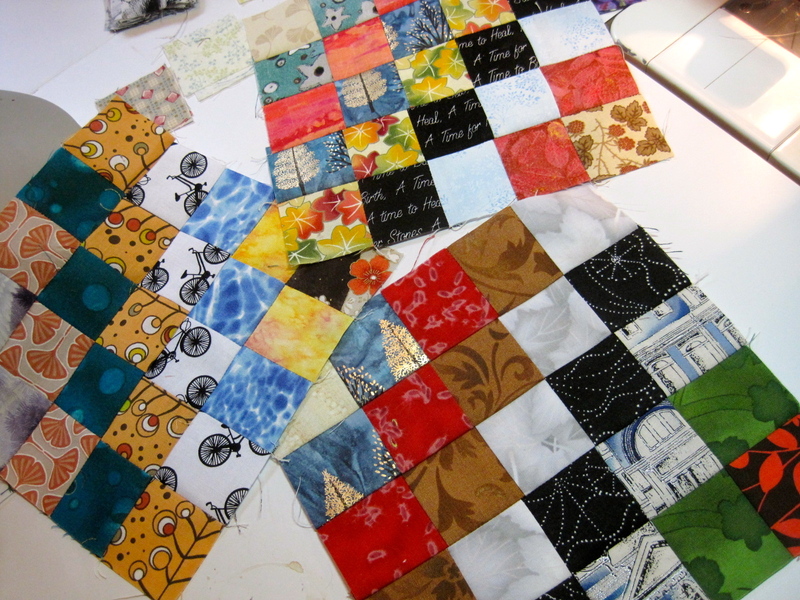 And of course, mostly in the evening, I continue to work on my little travel quilt. Who had the idea that the entire thing should be covered in quilting lines less than 1/4″ apart? Of course, supervised, as always, by Sophie. So that’s what I’ve been up to this week. It didn’t seem like I had done much. But when I put it all down in one place, it seems just fine for a week’s work. It has worked out great. 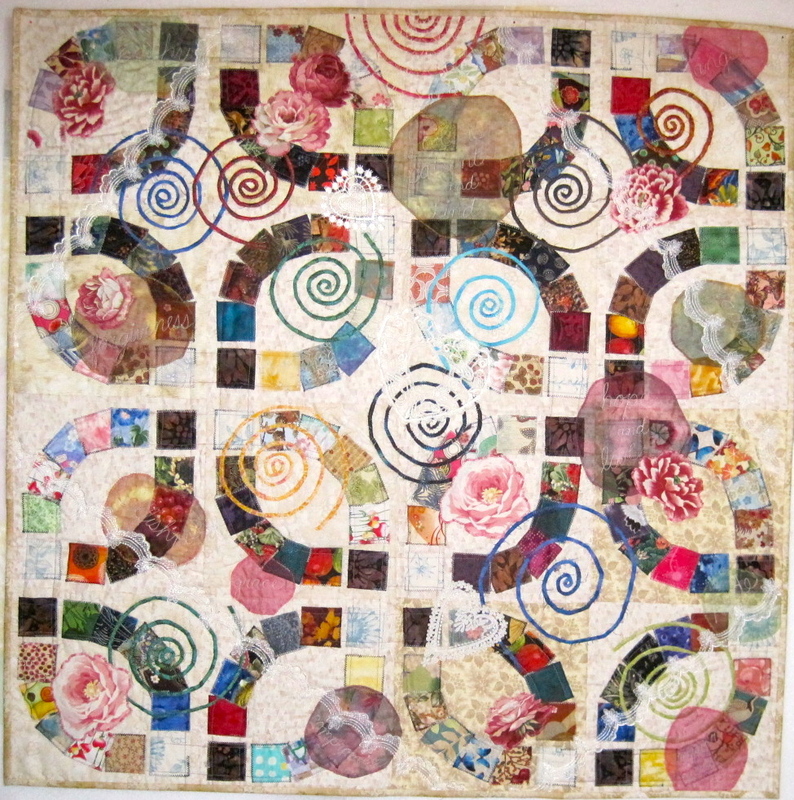 I am still thinking about my quilting, both current projects and future plans. And I will definitely be ready to pick up where I left off this coming Monday. I got all my chores and duties done, and I do believe I enjoyed them more because that resentment wasn’t there the whole time. What I didn’t expect was that I would fill in the spare time with some of my other hobbies that I still enjoy but never have enough time for. 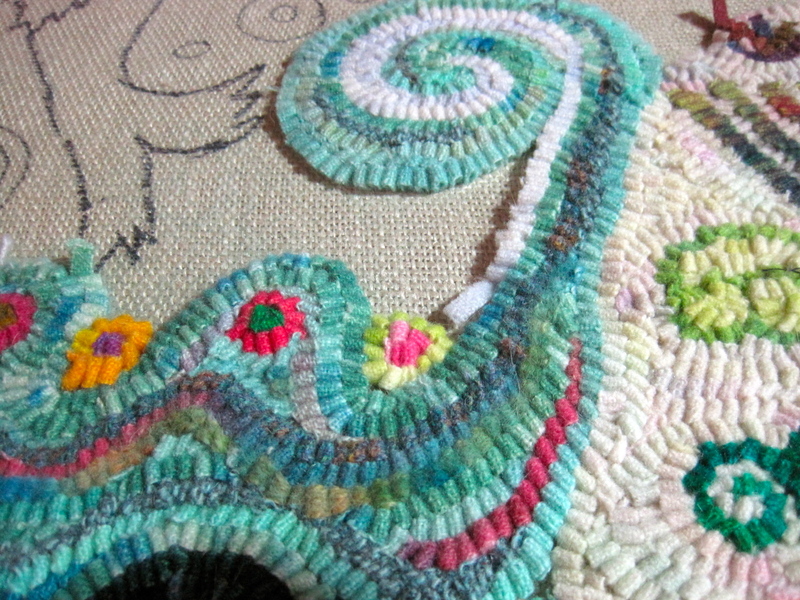 And finally got back to my rug hooking! This is always so exciting, because as you can see, much exuberant color is involved. I do truly enjoy rug hooking, but it does take a little space to get it done. So in my small studio-house (I just came up with that. I think I will keep that description. It takes the pressure off of trying to make it a ‘perfect’ house,) there is not really enough space to rug hook and quilt at the same time. These are some of the ‘tools of the trade’–strips of wool cut with a nifty cutter–it cuts three even strips at the same time. Don’t all of us artists just love a good tool? And also taking up a little of my time this week is attending to the never-ending needs of these guys. 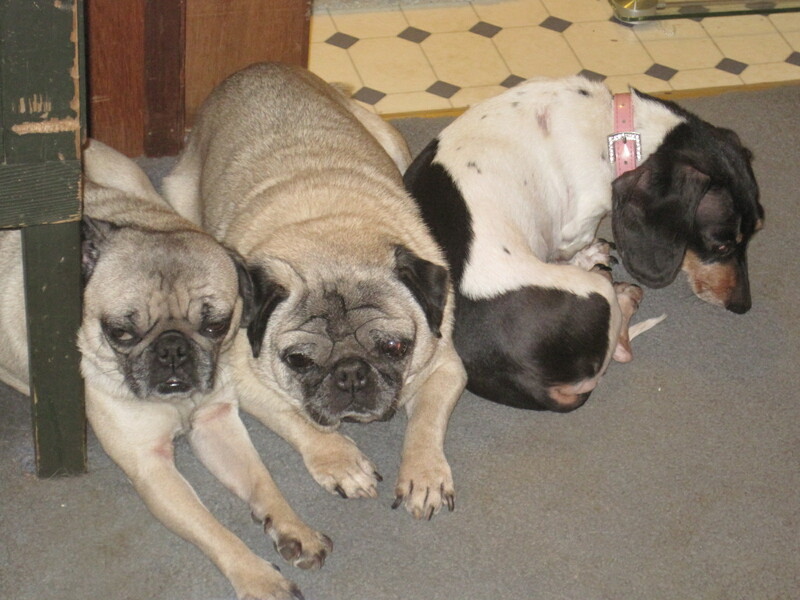 This is a picture of them lined up by the wall heater. They love it when I turn it on. 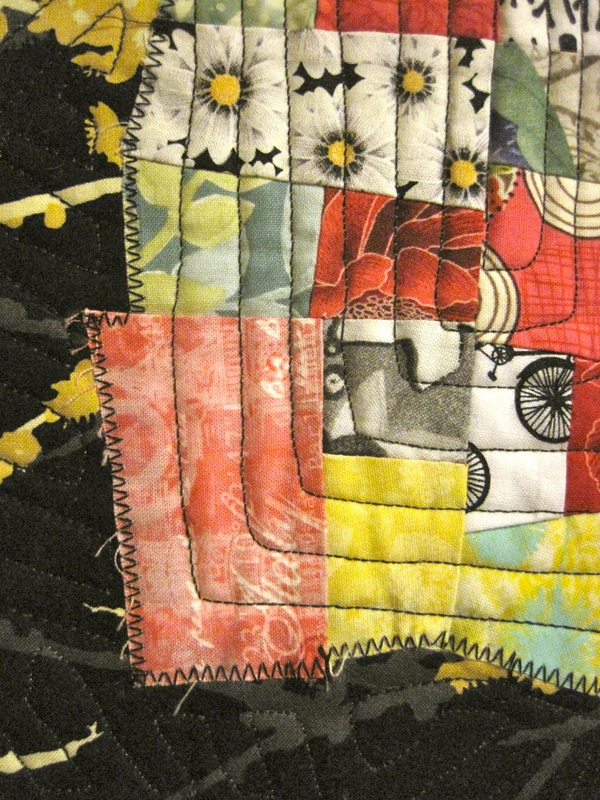 I’ll be back on Monday, with lots of quilting! Have a good weekend, and be sure to make time to take a stitch or two! I made that watercolor quilt. 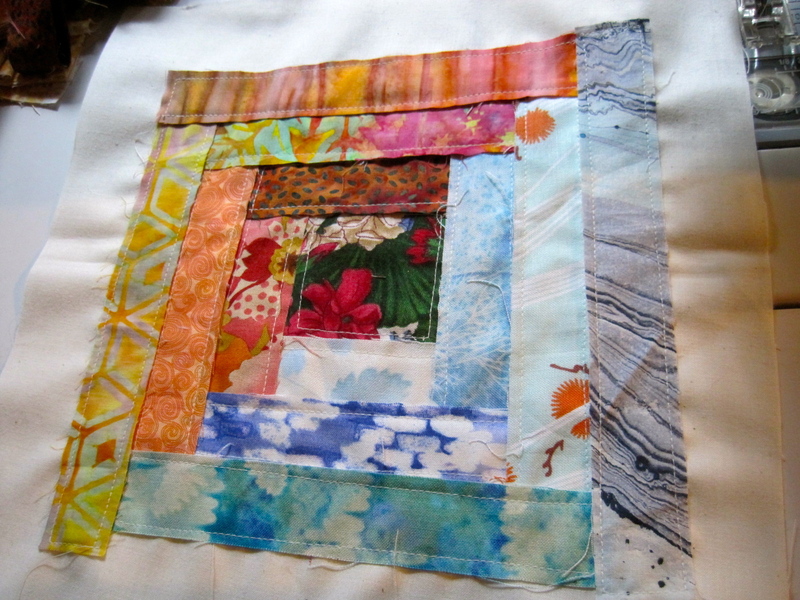 I like what I made, but I didn’t particularly enjoy the process of creating the watercolor quilt. The technique for that quilt involved fusing, and I am not particularly a fan of fusing. Hmmm, what to do, what to do, with all these little squares? I did a color block quilt that turned out to look like an empty grave to me. I named it “He Is Not Here.” You can see more of that quilt here. 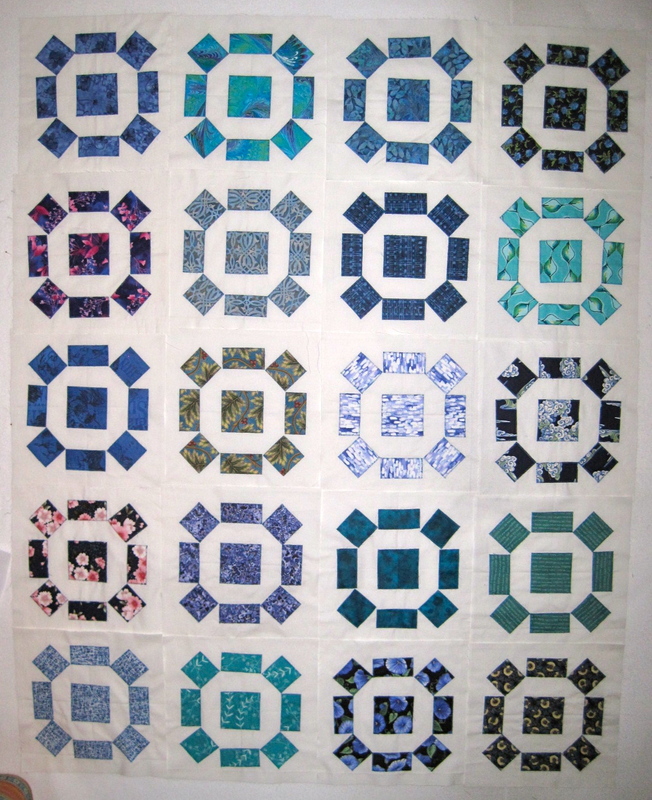 I used those little squares to make the prototype for the double wedding ring quilt. You can see that quilt here. 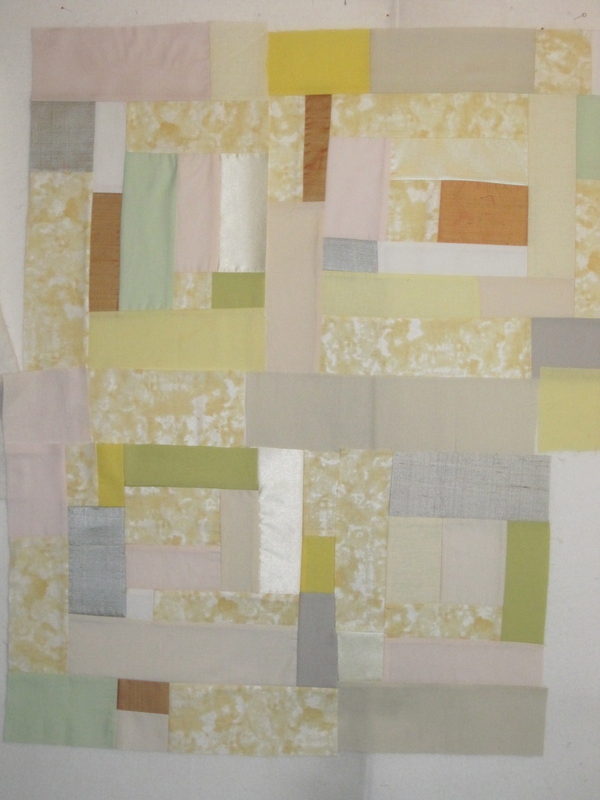 Right before I started the Housetop Quilt Project I experimented with sewing those squares together crooked. Here’s the result. I really like this quilt. I had almost forgotten about it. When I got it put together it had a very crooked edge. Instead of cutting away so much of that work, I decided to use my trusty zig zag stitch to stitch it just the way it was to a background fabric. 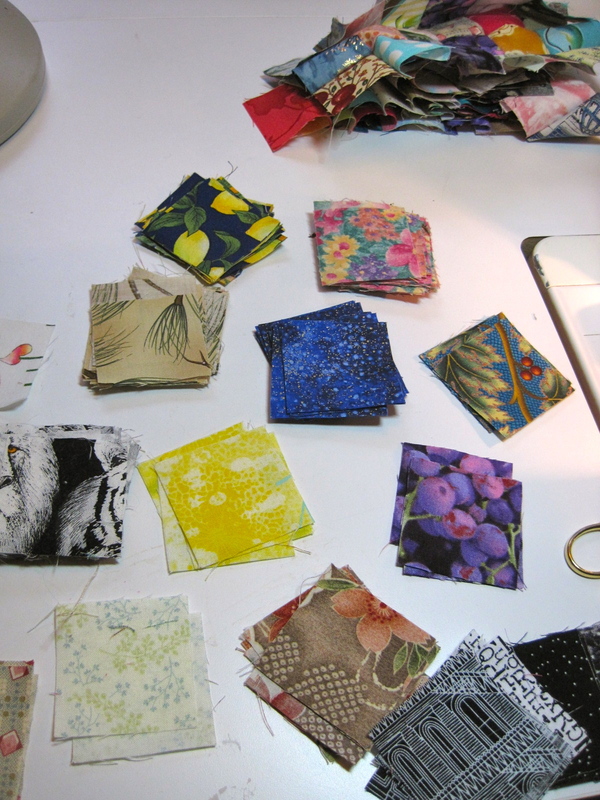 I had almost forgotten about my box of little squares, until Melody started her “Quilt Along With Melody” this month. She is doing a scrappy Trip Around the World quilt. I didn’t want to cut strips for the project, so I got out my box and started making the blocks for the Trip Around the World quilt. It takes me about 10 minutes to make one of these blocks. Its very fun to look through my little squares and put them together just so. They are a little addicting! I thoroughly recommend you starting a box of squares for yourself. You just never know when you might need a little square or two. And Back to the Zig Zag! I really liked that technique of making the Double Wedding Ring blocks by zig zagging squares on top of a background block. So when I ran across this pattern in a magazine, I thought it might be perfectly suited to the zig zag technique. I cut the article out and put it in my ‘to do someday’ file. The new year was that someday! The magazine article says this is the traditional Rolling Stone block. By using my method, I changed it from a block needing 25 little pieces (to be cut out and then sewn back together!) to only 9 pieces! (10 if you count the background block.) Love it! My design wall is in my bedroom! I love going to bed and staring at my current work, and thinking about what the next step might be. 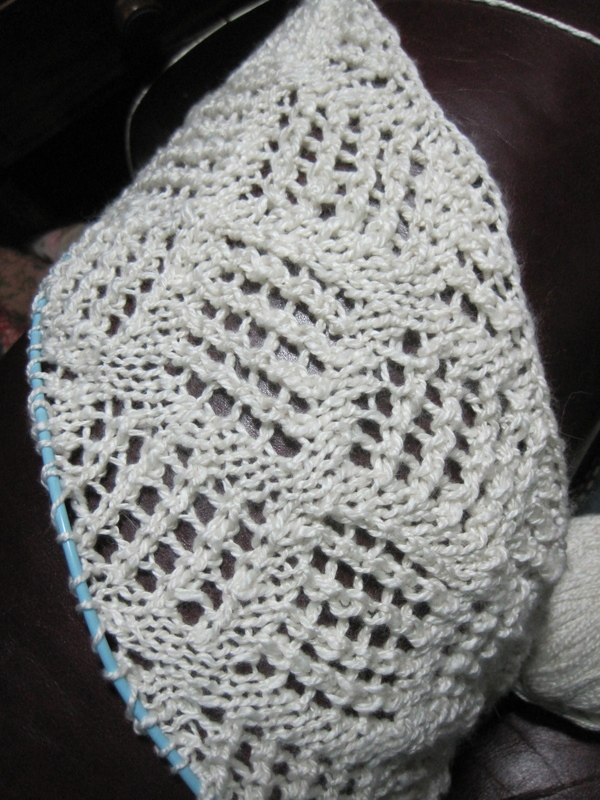 Last night I thought about whether I want to add a border to this, or to enlarge it. The answer to both questions was no. So I can get busy and put the top together and make a sandwich and quilt it! I have been working very consistently on my little “travel quilt.” That is the quilt that I took with me to Haiti to work on while I was there. BTW, you can take sewing needles with you on the plane. 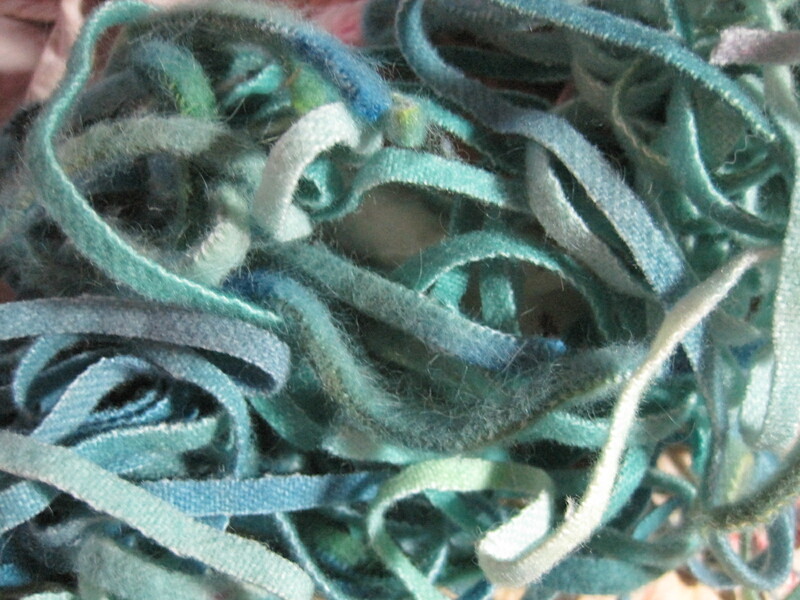 So I stuck three needles in the quilt sandwich, and I took some pre-cut threads with me. I actually never took a stitch on the airplane or in the airports. But I had my security blanket with me! 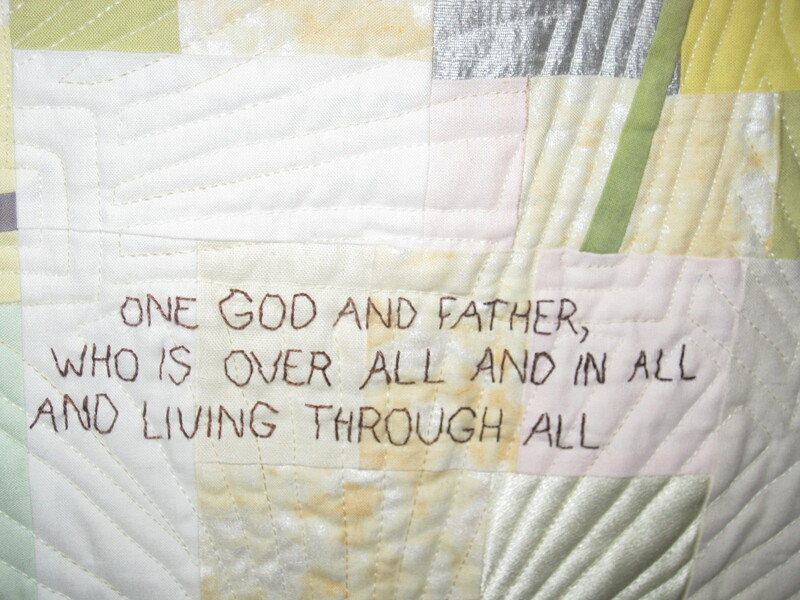 All the words are on the quilt. 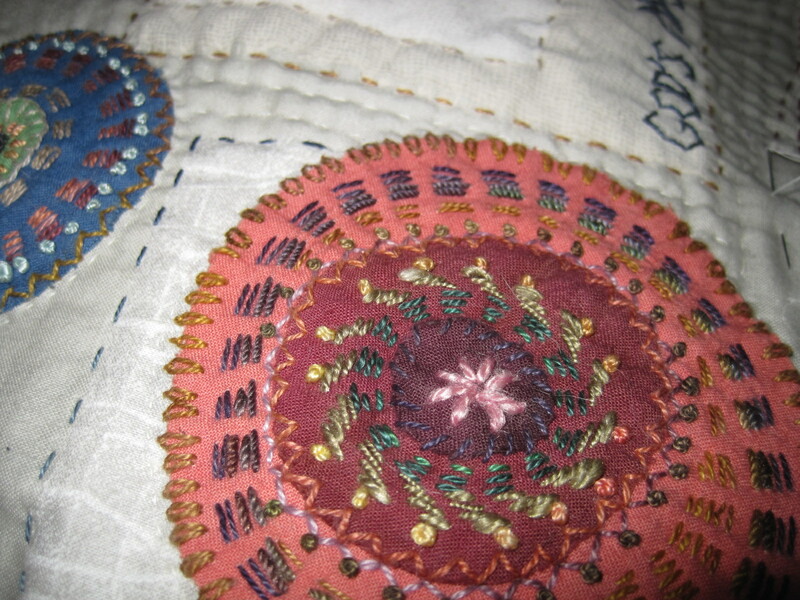 And most of the circles have been embellished with embroidery. 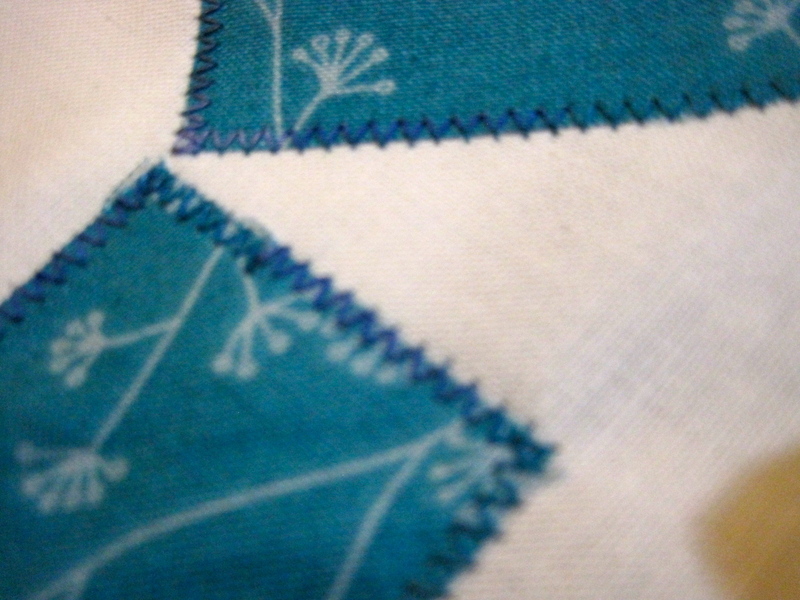 I decided to outline the squares in the background fabric with perle cotton. And then I am filling in the rest of the background with very close parallel lines of stitching. 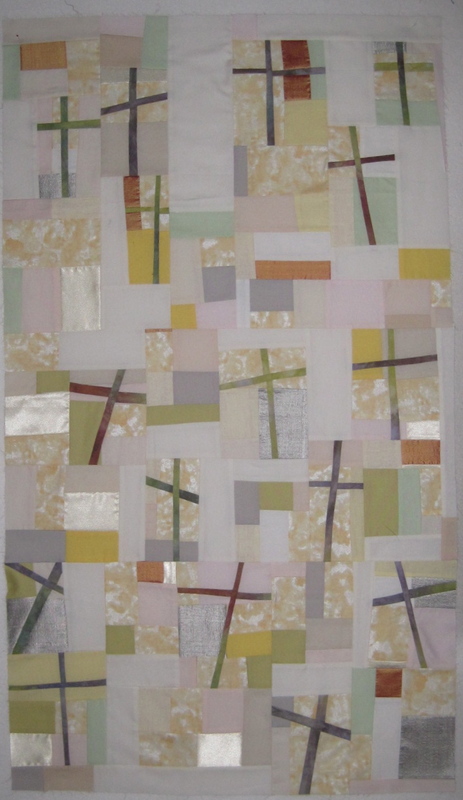 I made a pieced back for the little crosses quilt and put the sandwich together. 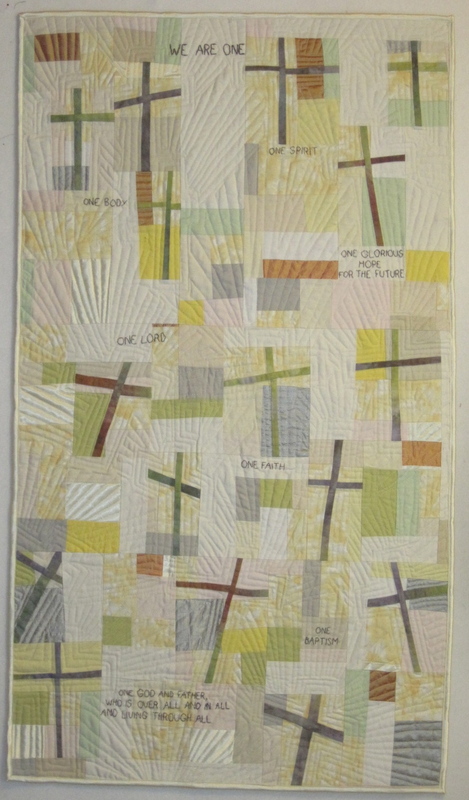 I’ve started doing echo quilting around the crosses. 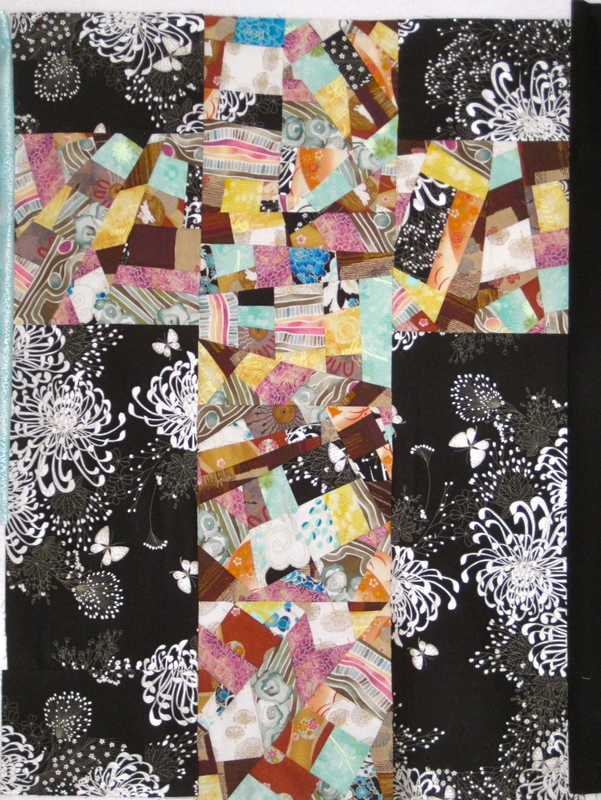 I am machine quilting this one, since there are so many seams. 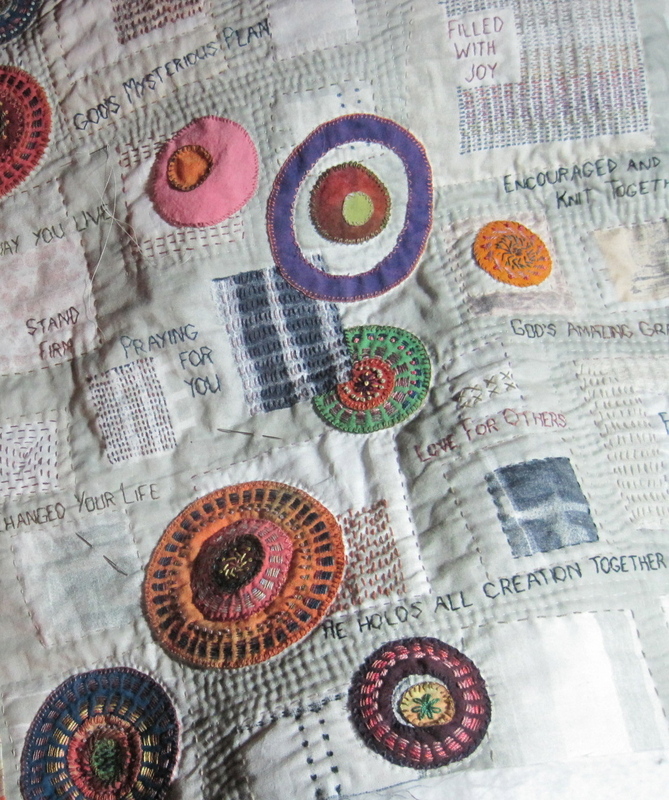 I will embroider the words after all the quilting is done. 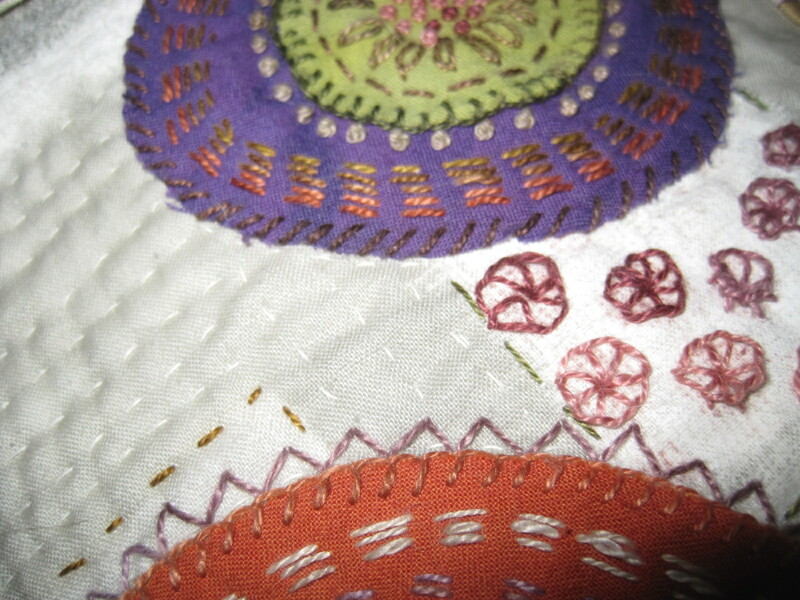 And if it needs it, I will add a little hand stitching embellishment. Its been a very full day. 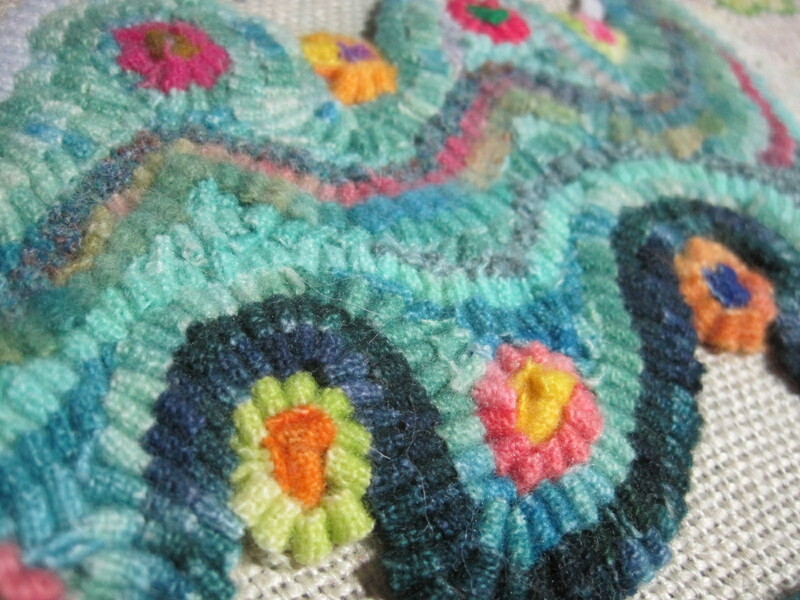 I’m off for some lap time with the doggies, and maybe just a bit more hand stitching. 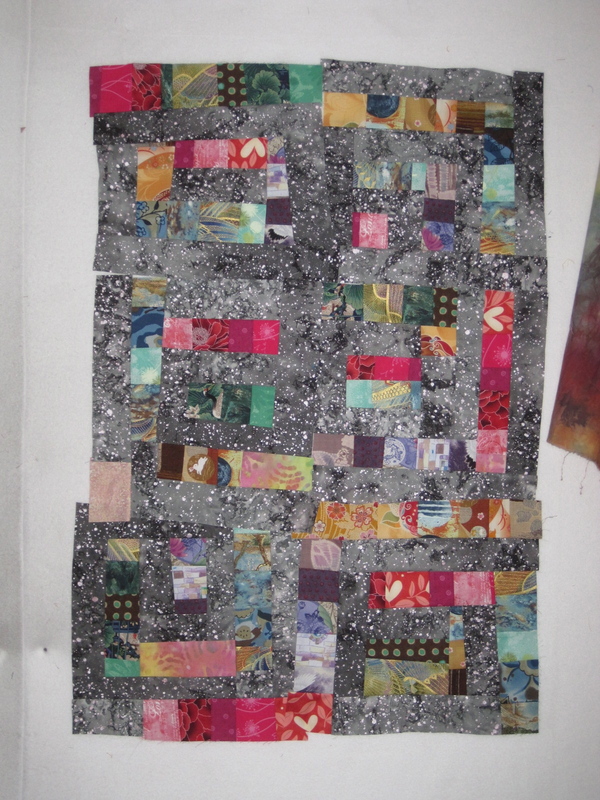 I am moving right along, continuing to create new work, still in the ‘housetop series.’ Although today I had an idea for a new series, kind of a “spin off” of the housetop quilts. We’ll see if that takes root or not. So this is a quilt that I started back in November, using large strips of mostly solids, along with a mottled shiny cotton print, and some silk and other shiny fabrics. I got 4 big blocks put together, and I DID NOT LIKE THEM. So they got put to the side for the holidays. 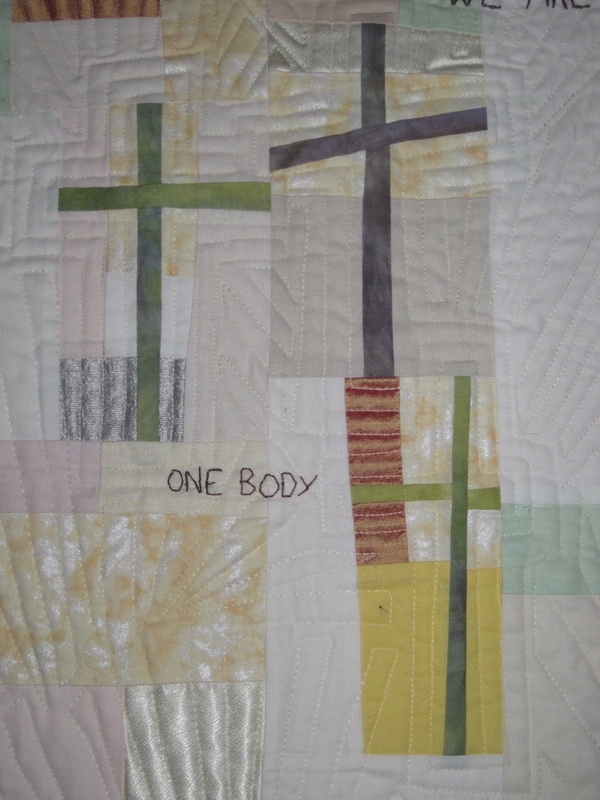 After I returned from Haiti, I was still thinking about those blocks, and in looking through some magazines I saw a tiny picture of a quilt with some skinny plus signs in it. And I thought, hmmmm, that’s kind of like crosses. So I took those big blocks, and I cut them into little pieces, and then I cut them some more, and inserted skinny strips into them to make crosses. And then I put all those pieces back together. Now I LOVE it. And after the crosses were inserted. For there is one body and one Spirit, just as you have been called to one glorious hope for the future. 5 There is one Lord, one faith, one baptism, 6 and one God and Father, who is over all and in all and living through all. I’ve been staring at the finished top for a few days now, and I have a good idea of how I’m going to quilt it, and where the words will be placed. I’m anxious to start on it tomorrow morning.